There are two new coffee sets in the February Essentials by Ellen release! 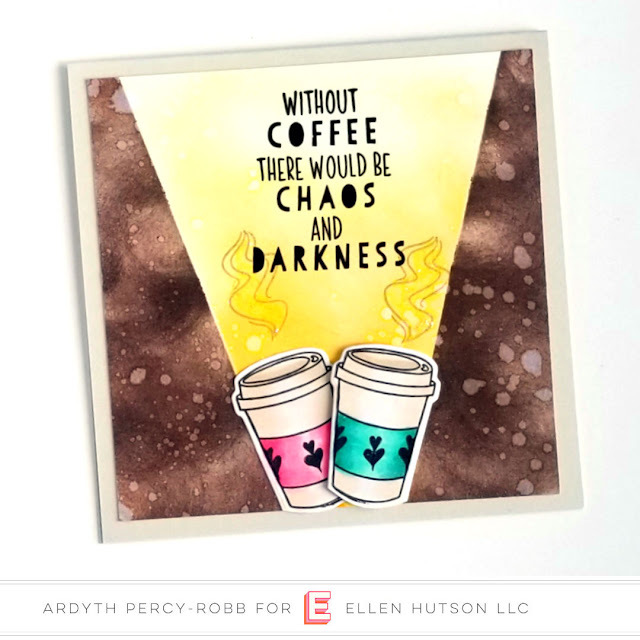 A Breve Note has lots of classic coffee images along with some pretty funny sentiments, and I knew immediately I had to make this card, inspired by the Chaos & Darkness sentiment! I started with a square panel of white cardstock. I masked off the 'almost-v' in the centre and swirled some brown Catherine Pooler inks on the edges, to create a coffee-coloured impression of chaos and darkness. It was strange to NOT be trying to get a smooth blend, but fun to use this method to create some texture. I sprtized the panel with water for some more texture, but made sure not to leave the water on for too long - I used Neenah here. Once the darkness was done, I blended the 'light'. I used a blender brush to make sure I got a smooth blend on this one - this card is a study in opposites! I finished by stamping the sentiment and the steam, and then adding the two coffee cups (which were coloured with Copics and decorated with a stamp from Latte Love).